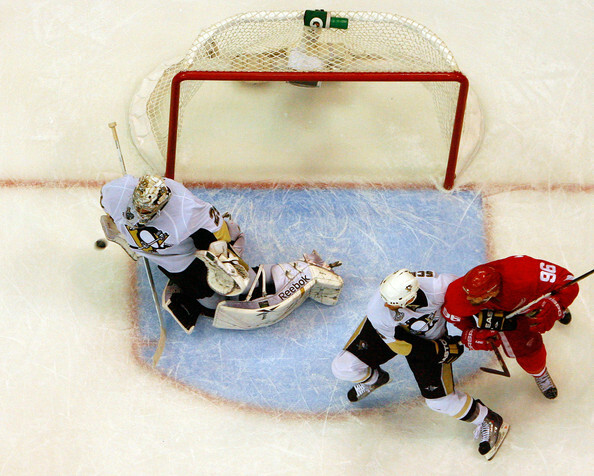 What Marc-Andre Fleury has done so far in these playoffs is nothing short of awesome! However, my view of Fleury has changed over time and I know others have felt the same way. Hopefully this article will be something others can relate to and maybe even glean some statistical insight that they weren't aware of before. Don't worry though, I'm not going to chronologically recount past success and failure. Instead, I'm going to offer up facts that show how my perception was created, when it changed, and why. After the 07-08 finals I was a card carrying member of the Fleury fan club. His play had been outstanding, even in defeat, and it was a general consensus that his athletic ability was on par or better than any goaltender in the game. Many will look at those early cup runs of the current core and rightfully attach the success of those teams to the two young transcendent talents who weren't even in their primes at the time. But, the body of work Fleury put together in the 07-08 postseason specifically, was elite. To put it in perspective, only three guys in the salary cap era who have won at least 12 games in a singular postseason have had better save percentages! This actually didn't start until the end of 14 -15 because after that year under Mike Johnston I was convinced that the coaching staff of the Penguins had shackled the best offensive players in the game to insulate an overpaid underachieving goaltender. But the seeds for this were planted in 09-10 when some guy named Jaroslav Halak stopped roughly 92% of the shots faced in game 6 and roughly 95% in game 7 to upset the Penguins in their second round series and eliminate any "repeat" dreams. 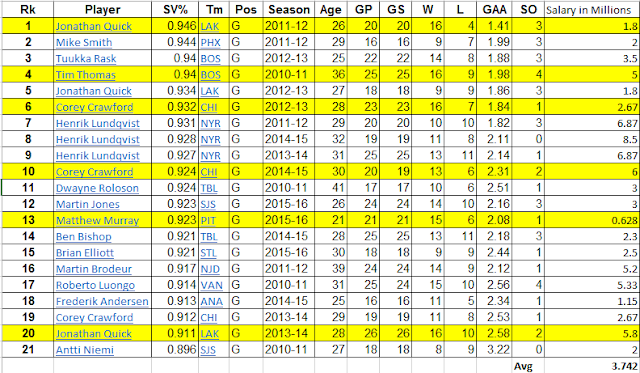 Now, Halak is/was by no means a bad goaltender. But, that series highlighted how unpredictable good goaltending can be and ironically these current playoffs have been a prime example AGAIN that any team can be sunk like wooden battleship if the goalie implodes. So, by the time 14-15 season concluded, while I was aware that issues like coaching changes, questionable roster composition, and injuries were to blame for torpedoing 5 years of #87 and #71's primes, one reoccurring theme kept popping up. The volatility of goaltending. The damning piece for me was when I discovered a stat called "quality start" data that I used to compare Fleury to other current elite goaltenders. (It grades a goaltender on how his starts compare to the "average" or passing grade of all goaltenders during that year.) The following table is a good representation of that. Remember that reference I made to Tuukka Rask not having multiple cups and playing golf right now? Well, the above guys are widely considered the cream of the crop and they have as many cups as the Capitals. Yet, both guys are getting paid huge dollar amounts. (8.5 million for Lundqvist and 7 million for Price) AND both are golfing right now! The sum of those facts altered my perception and in a way expanded my hate beyond Fleury and directed it towards the larger issue that there isn't one goalie who ALWAYS delivers when it matters. And in the salary cap era, few if any have been good enough to routinely lift their team close to a championship without the following three keys in place. This convinced me that team building in hockey shouldn't be centered around finding a franchise goalie. But, rather finding a really talented goalie who can play well enough not to lose games. Personally, I might draft a goaltender, or two, every year just to make sure I have at least one who can get hot come playoff time. The extra money can be spent on depth around him. And, this Penguin's core is actually a unique microcosm of how chunks of great player's careers can be lost betting that "your guy" is going to be really good come playoff time. That fact alone makes goaltending almost as streaky as goal scoring. So why pay top tier market value for a goalie?.....EVER?! That average at the bottom is unique because it interestingly happens to roughly be the annual cap hit of Matt Murray's new contract that kicks in next year. It's up to you though how much you read into that. This article almost began with the sentence: "The proverbial "franchise goalie" may be the biggest outdated myth in professional hockey today." After all of it though, I will admit that these playoffs have been an enjoyable smirk-inducing reminder for me what a franchise worthy talent Fleury is and that..." level"....he can get to. And god bless him, because the Pens needed him to, especially over the past series. In retrospect, it was a bit immature to be a hater of anyone who has helped a team one roots for win a championship. But, like many, watching the primes of #87 and #71 nearly slip into the great beyond because of things out of their control was frustrating. In addition, I was wrong to lay so much on Fleury. Whatever personal anxiety, inconsistent focus, or positional blunders occurred for him between 08-09 and this year were only highlighted by the 3 factors mentioned in The Hater section that wasn't in his control. Heck, even before the cap era existed the legendary Patrick Roy could only do so much. And he is a perfect example having been surrounded by the likes of Joe Sakic and then Ray Bourque in his later years after leaving Montreal. The bottom line is that a good goaltender's play can get hot, and when it does, their talent can be a deciding factor in games and series. 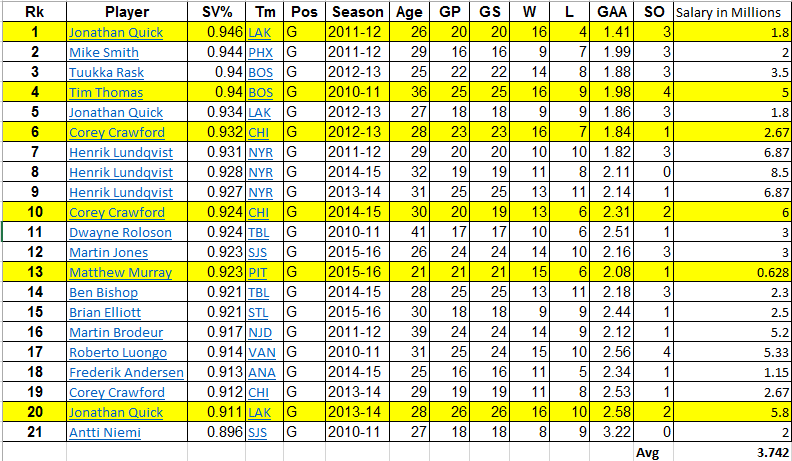 So, I'm on board with the narrative that the goaltending position may be the most important position in hockey. My acceptance of that hasn't changed since watching that 07-08 postseason. The flower is in bloom and I hope he continues this great run!